‘STUPID IS AS STUPID DOES’ – FORREST GUMP. Branding bonkers. 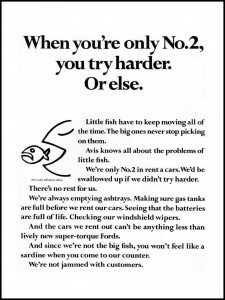 Gump must have seen Enterprise Rent-a-Car’s current UK ad. Enterprise Rent-a-Car’s long-running television ad campaign uses a couple of ‘salesmen’ known as Brad and Dave. Dave is a weedy little man who continually attempts to Anglicise the loud-mouthed American moron whose name is Brad (well, coming from the good ‘ol USA, it would be, wouldn’t it?). The ad series launched in 2012, and is now back on UK screens – again. Currently, it features some buffoonery with seemingly confused customers looking on. The ad ends with Brad and Dave proudly boasting: ‘It’s UK car hire with US customer service.’ Branding excellence in a campaign? I don’t think so. I’ll get onto the dangers of using idiotic humour to get attention in a moment, but first I have to state my personal experience with Enterprise. Having hired a van to take me, my wife (a PR consultant) and a shedload of equipment to an event we were organising in York, the Enterprise ‘service’ went from bad to worse. The van arrived three hours late, which obviously had a major knock-on effect in that we didn’t arrive in time for preparation before a nice dinner that evening. Instead we consumed junk-food takeaways as we worked through the night, still expected to be sparkly fresh ready to host the event in the morning. Claiming a refund was a nightmare. Five people got involved and all of them, including the Branch Manager, were totally incompetent at organisation and communication. After it was escalated to the Area Manager (I trust he fired all the idiots at the hire centre) we finally got a full refund, some four weeks after the event. But that wasn’t the end of the story. Despite repeated requests to come and collect the damn van, it sat on our driveway for over seven days. One pathetic Enterprise employee asked us to leave the van out on the road with the keys in it and they’d collect it ‘when they could’. Yeah, like we would happily assume responsibility for it should it get stolen. Now, that’s only one experience of a totally disgruntled ex-customer – me. But judging by some of the unhappy customers on sites like trustpilot I’m not the only one. ‘Fraudsters’, ‘Avoid Enterprise’ and ‘Disgrace’ tell some pretty sorry tales, but to be fair there are other customers who seem quite happy with Enterprise. Everyone screws up sometimes, so let’s end that bit. My main point, though, is the sales proposition suggesting US customer service is somehow better than UK customer service. Where the hell did this idea ever come from? It’s always best to get your facts right, and that’s certainly not the case with this ad. The American Customer Satisfaction Index in its latest report calls current US customer service ‘the longest stretch of deteriorating total customer satisfaction since 1996 to 1997’. Oops. You mean Enterprise offers you crap customer service? Well, if their claim is based on US customer satisfaction levels, some might say they are right. The other point is worthy of a separate Brand Blog, but I’ll state it here in brief: When you use rank stupidity, idiots and fruitloops in an advert designed to make people laugh, you’d better make sure that you have the humour right. Attempting to generate laughter just because the creative team or client thinks it’s funny is a sure-fire recipe for disaster. (And please don’t tell me ‘it did well in research’.) Instead of creating positive engagement, it can cause a really unpleasant reaction to the brand. What’s more, humour might get a high advert recall, but often low brand recall. In my Brand Blog on this (coming soon) I’ll give an example of how brand recall can even promote the competition! If he approved this ad (he must have done), then I’m really disappointed. Lee is also head of DrivingFutures, Enterprise’s programme and vision ‘To be the best transportation service provider in the world, to exceed our customers’ expectations for service, quality and value, to provide our employees with a great place to work and to serve our communities as a committed corporate citizen.’ The website is loaded with positive, emotional and engaging copy, stories, facts and figures, all presented in an intelligent manner. There are hundreds of potential campaigns that could come out of its brand-building information. In fact their current US campaign is an award-winning emotional slice-of-life situation, where the humour is supportive of the overall brand context, highlighting the Enterprise ‘We’ll pick you up’ service. In all ways, it really does come out on top. Take a look here at one of the ads: Family Reunion. Lee lives in St Louis, USA, where Enterprise is headquartered. Maybe he just doesn’t get the cross-cultural humour issues; or maybe his UK ad agency, Dare, persuaded him that the ad series was ‘bang on target.’ Either way, it’s sad, because the ads for Enterprise related to their US market really are so much better. Whether telling a joke at a party or broadcasting your own humour preference to a mass television audience, it is risky at the best of times. The perception of humour involves a complex interplay of several neural areas in the brain, and the outcome of all this processing may not be a positive one. Yes, humour gets attention. But according to a study by Weinberger & Gulas less than half the ads using humour are effective. Another piece of research indicates that humour in advertising does not influence message comprehension any differently to other methods (like, for instance, being serious). Humour, then, should be used as a support element to a strong proposition, not a substitute for interesting content. 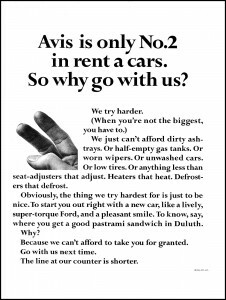 In 1962 Hertz Car Rental were number one in the US, while a struggling Avis came in a poor second. The ad agency Doyle Dane Bernbach put together a campaign based on something quite rare in advertising nowadays: the truth. Avis admitted that Hertz was the leader in the car rental industry, but Avis ‘try harder’. The campaign increased the Avis market share by a staggering 35% and their brand was perceived as hard-working, honest and on the side of the customer. In many respects, the whole campaign contained humour, and was well executed. It was less risky, because the humour was linked to something that customers could connect with. Again, research shows that humour which is related to a clear product or service benefit (and I don’t think this comes across in the UK Enterprise ads) fares much better than indirect humour which is not related to the brand message. Far better to do an honest ad, with an emotional connection that builds the brand. Just like they are doing in the US. No need to rely on two simpletons attempting some kind of cultural quid pro quo via acts of doltish behaviour. Come on, what does that really say about the company? In my view, get Cannoball, the St Louis-based agency that developed the US ads, to come up with a UK-equivalent campaign that’s culturally acceptable and above all, not stupid. That approach, in my opinion, would probably be far more enterprising. AND TWO CHAPTERS FROM MY BOOK. I respect your privacy, and do not rent, sell or divulge your details to any third party under any circumstances. End of. BRANDING? THANKS FOR THE MEMORIES. HOW WELL WILL YOU SELL IN 2019? IS YOUR MARKETING 50 YEARS OUT OF DATE? PROBABLY. DOES YOUR BRAND HAVE A LEXICON? Brand Doctor: A brief bio. I’ve spent nearly 40 years in advertising, marketing, design and branding. Starting life as a graphic designer and copywriter, I worked for Top-100 companies. I then progressed to heading up brand consultancies responsible for sales and marketing, branding, corporate identity and advertising for Yellow Pages, Virgin, AVIVA, EMI and British Telecom to name a few. I’m also a qualified psychotherapist. How people think and behave is crucial to knowing how to brand a business, and with 15 years of experience in the field of psychology, I'm better equipped than most to deliver brands that connect and engage with customers. Psychology is a rare ingredient in marketing, but it should really lead the way. My psychotherapy work greatly influences the approach to branding I teach and formed the basis for my international best-selling book Branding Your Business. ‘James gave two consecutive keynotes for the past three years at our annual Indonesian Superbrands Conference. He is a breath of fresh air, bringing clarity and understanding to an audience of 400 senior marketing executives hungry for knowledge of ways to create leading-edge business and branding strategies. James also gave two brilliant keynotes on the subject of sustainability, in advance of his new book The Starfish Business. He is now a Member of the Board of Advisors, Most Valued Business Indonesia, an exciting new initiative to recognise brands not just for their revenue, but for their social responsibility. The Brand Doctor is a Registered Trade Mark. All material on this site is copyright © 2019 James Hammond, The Brand Doctor. All registered trademarks included on this site are the property of their respective owners. Site designed and built by The Brand Doctor.